Now that we're right into Summer, I like to make sure my skin is in tip top condition. Moisturising is all very well on it's own but exfoliating can make a huge difference to the texture of your skin. 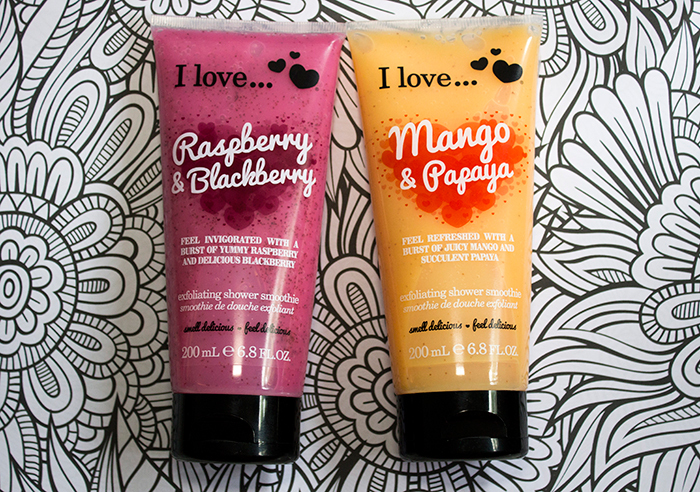 To keep my skin feeling smooth I've been using the I Love...Cosmetics Exfoliating Shower Smoothies in two different scents to get my skin Summer ready. Here's what I think of them. The Exfoliating Shower Smoothies come in 4 different scents but today is all about Raspberry & Blackberry and Mango & Papaya. Each scrub features a fruity scent and natural almond shell to gently exfoliate the skin and are more environmentally friendly than typical exfoliating beads. They're also soap and paraben free. The Raspberry & Blackberry Exfoliating Shower Smoothie has a real strong, fruity scent which you would expect from the name. If fruity scents are your thing then you won't be disappointed with this one. If you prefer more of a tropical fruit scent then the Mango & Papaya Exfoliating Shower Smoothie would be a better fit. This one isn't quite as strong scented so if you want something a little more subtle then mango would be the way to go. I would say these are more of a shower gel and exfoliating duo rather than full on exfoliator. The product does foam and lather really well which makes the exfoliating process much more comfortable. If I had any criticisms I would have liked to have seen a little bit more exfoliators in the product but for a 2-in-1 product, I think it's really good value for money.